1. Even in a SELLERS market, Sellers still have to PRICE it RIGHT! In the real estate collapse that began tumbling down in 2008, real estate agents had to get really good at pricing property. With 1+ year supply of inventory sitting on the market, we knew to sell a home; it had to be priced RIGHT immediately out of the gate. And, honestly, many of us agents just couldn’t afford to take overpriced listings that we knew we couldn’t sell. It was a tough time and we all learned a great deal through it. Guess what? Testing the market is a bad idea. Twenty-five percent of all listings are still failing to sell. That means 1 out of 4 homes that are put on the market, fail. Why? The #1 Reason is Price! And, the homes that price right, sell in 7 days for 100% of their original list price on average. Yes. Let me say that again. Homes that are priced correctly, sell in 7 days for 100% of original list price on average. WOW! 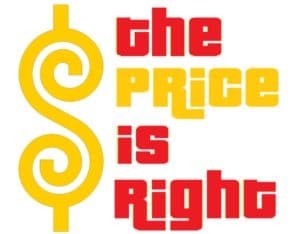 It is crucial to price it right – no matter the market! 2. SELLERS always want more $$$ – no matter what! Yes, we sellers (me included) always want more money for our house. It’s human nature, right? And, that doesn’t matter the market! We can tell a seller they are walking away with $100,000 and they were hoping for $150,000. 3. BUYERS always want to pay less $$$ – no matter what! As agents, we know these things! Our #1 priority is YOU, our clients. We spend countless hours each month analyzing the latest real estate statistics and trends. And, our listing team spends hours prepping comparable properties for meetings with sellers. We take pride in pricing properties correctly and getting our sellers the MOST amount of money. We also take pride in getting our buyers the best deal. And, in this market, sometimes the best deal is just getting the house! Multiple offers are still out there for properties that are priced correctly… That’s why the house that’s priced right sells in 7 days for 100% of list price on average! When you hire The Peters Company to help you sell or buy, I can promise you that we’re going to know our numbers. We’re going to put evidence before emotion. And, we’re going to help you make the very best decision possible. Give us a call today.